The plate tectonics of the 2019 NFL offseason are now in motion. 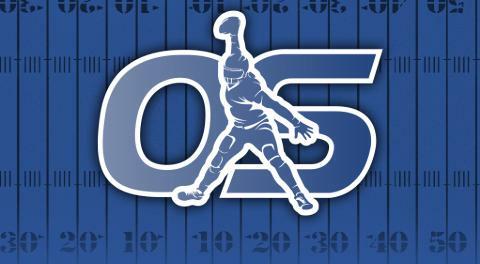 The Antonio Brown sideshow hasn't skipped a beat, Odell Beckham Jr trade rumors are swirling for the second straight offseason, teams are starting to clear cap space and starting on Tuesday teams could start placing the franchise or transition tag on one of their pending free agents. 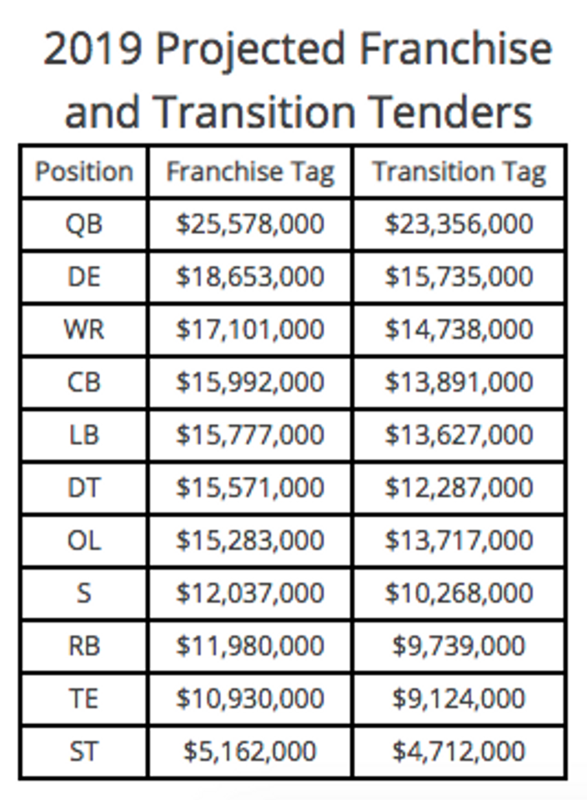 Below are the projected franchise and transition tag tender amounts by position, per OverTheCap. Like most years, there will be a few interesting storylines that will be playing out in the weeks to come. 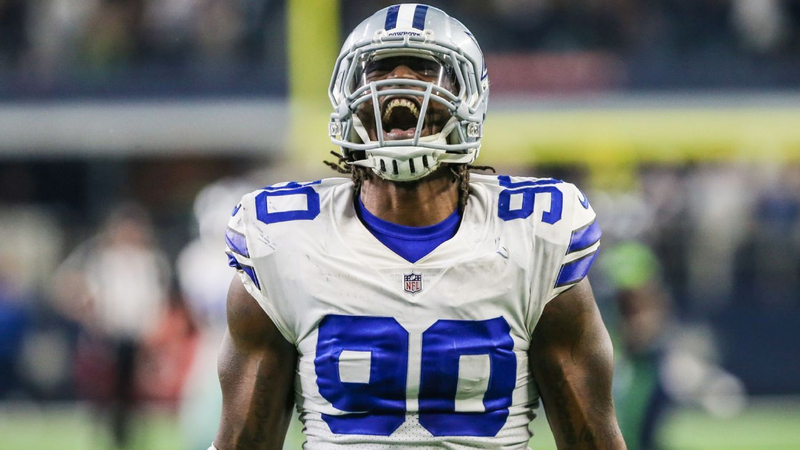 For the second time in as many years, the Dallas Cowboys are going down the path of placing the franchise tag on Pro Bowl Defensive End, DeMarcus Lawrence. In the past 48 hours, there have been conflicting reports on if Dallas was going hit Lawrence with the franchise tag and if Lawrence would even sign the tag again. Dallas has until March 5th to decide. At this moment, I think it's fair to assume that each side is posturing. It wouldn't make sense for Dallas to let Lawrence walk and by placing the tag on him it at least gives him the option to sign the 1-year deal and also time for both parties to work out the massive extension he is looking for. In the event that Dallas does tag him and doesn't offer a worthwhile deal, it would not be surprising to see Lawrence bet on himself again, take the $20+M guarantee and test free agency in 2020. The $20.5M Lawrence would be set to take home in 2019 would be the most in the NFL for a defensive player, based on total cash. He's getting PAID and gets to test the waters again in 12 months where 31 other teams will be competing for services. Kirk Cousins and Trumaine Johnson played on the tag for two straight years before hitting free agency last year and look at how it turned out for them. By the way, if Lawrence were to play on the tag again, the $37.6M he would have collected in just two years is more than what Chandler Jones ($31M) and Melvin Ingram ($34M) were guaranteed when they signed their new extensions in 2017. Both players had the leverage of the franchise tag too. Speaking of extensions and free agency there is a real benefit to agreeing upon long-term deals and on the flip side, not enough is made about the above market price you pay on the cap when you franchise tag a player. Since DeMarcus Lawrence, Jadeveon Clowney, Frank Clark, Grady Jarrett, and Dee Ford are the most likely players to receive the franchise tag in the coming days and weeks lets look at how their Year 1 cap hit on the tag would compare to recent players who were tagged and negotiated extensions as well as just plain free agents. There is a huge disparity between playing on the tag than when teams are able to sign a star player and are strategically able to spread out the cap hit over the span of the new contract. We're talking large sums of money up front. Money that could be used to acquire another legit starter or a few contributors in the short-term. Last offseason, Sheldon Richardson, Tyrann Mathieu, Eric Ebron, John Brown, Nickell Robey-Coleman, Mike Pouncey, Adrian Clayborn, Rashaan Melvin, Muhammad Wilkerson, etc all signed short-term deals in the $4-8M dollar range. Each team's situation is different but for a team in Dallas' shoes, who has Super Bowl aspirations, the ability to sign a few more contributors is a huge deal. Lawrence's cap hit would be 2x's what it would theoretically need to be. It's even more extreme for linebackers. The Kansas City Chiefs are in a tricky spot with Dee Ford. It's reminiscent of the Packers and Nick Perry in 2017. Both players are former first-round picks, with a history of injury or ineffectiveness early in their career before having breakout campaigns in Year 5. The Packers decided to not franchise tag Perry but later on agreed to an extension while he was a free agent. The Chiefs, much like the Packers were in 2017, are in a perceived "Super Bowl Window". They might want Ford to prove himself again but there are real benefits to reaching an extension with him. It would allow Kansas City to have more breathing room to stomach Justin Houston's 22.1M cap hit and more cap space means room to make other improvements on the roster. Ultimately we're entering an era where teams will need to be more thoughtful about how they handle franchise tags and extension situations. Players are more willing to push the traditional limits of contract negotiations, considering salaries have skyrocketed to the point where they have life-changing money guaranteed as a fall-back plan. It's also clear that getting too cute in contract negotiations can leave you handicapped to the point where it can be a detriment to success in the present.